Whether your spouse agrees to a divorce. Whether you and your spouse can agree on how to settle the specific issues of your divorce. Ensuring your rights and interests are protected and advocated throughout the upcoming divorce process. Making informed decisions regarding your divorce and the related issues. Resolving your divorce as favorably and efficiently as possible. A Petition for Dissolution of Marriage (and related documents) is filed with the court. The other partner in the marriage is served with divorce papers, unless this spouse specifically waives this in writing. The other partner has the opportunity to respond to the Petition within a limited time frame. If the other partner is served within the state of Arizona, the response period will be 20 days; if the other partner is served outside of Arizona, the response period will be 30 days. If no Response is filed within the allotted timeframe, the Petitioner (i.e., the spouse who filed the initial Petition for Dissolution of Marriage) can apply for a default. Once a default has been filed, the other partner will have 10 days to respond. If no response is again filed, the divorce may be granted on all of the Petitioner’s terms. If a Response is filed and both partners can agree on how to resolve the issues of their divorce, they can file a Consent Decree of Dissolution of Marriage that lays out their divorce agreement to a family court judge (who will likely approve it). Grounds for filing for an Arizona divorce – Given that Arizona is a “no-fault” divorce state, the only grounds for filing for an Arizona divorce is an “irretrievable breakdown” of the marriage. In other words, it’s sufficient for at least one spouse to believe that the marriage is broken without the possibility of reconciliation in order to have grounds for filing for an Arizona divorce. Conciliation meetings – In the event that one spouse does not agree to the divorce, (s)he can request a conciliation meeting with the court at no charge. If the outcome of this meeting is that the parties do not agree to put off filing for an Arizona divorce, then the divorce will proceed. The role of the court – The family court will have a limited role in divorce cases when partners can agree on the issues of their divorce. 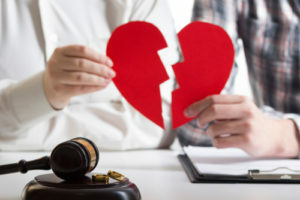 If, however, they can’t agree on even one issue, then the divorce will have to proceed to trial, where the court will intervene and play a bigger role in resolving the dispute(s) related to the divorce. There may be a lot more that you want to know about filing for an Arizona divorce, so don’t hesitate to contact Scottsdale Divorce Attorney Karen A. Schoenau for honest answers to all of your questions about filing for an Arizona divorce. Are you getting ready to file for divorce in Arizona? If so, you can rely on Scottsdale Family Law Attorney Karen Schoenau for honest answers, effective representation and the best possible outcomes to your case. To receive professional advice and learn more about our superior legal services, schedule an initial consultation with Divorce Attorney Karen Schoenau. You can set up this meeting by calling 480-845-0251 or by emailing us using the contact form.